I am going to start this article with a disclaimer: the title is a clickbait, or maybe not - depends on how you look at it. Haven gotten that out of the way, let's get to the meat of the matter: creating a useful default package.json. If you have gone through the official npm docs, you might know that you can create a default package.json configuration; thereby skipping the CLI questionnaire that follows whenever you run the npm init command. These are the only required properties for a npm package. However, the thoughtful guys at npm allow us, devs, to change the default configuration or CLI questionnaire. Here's how. As you might have guessed, to create a default package.json configuration, you need to create a .npm-init.js file in the home directory of your PC. 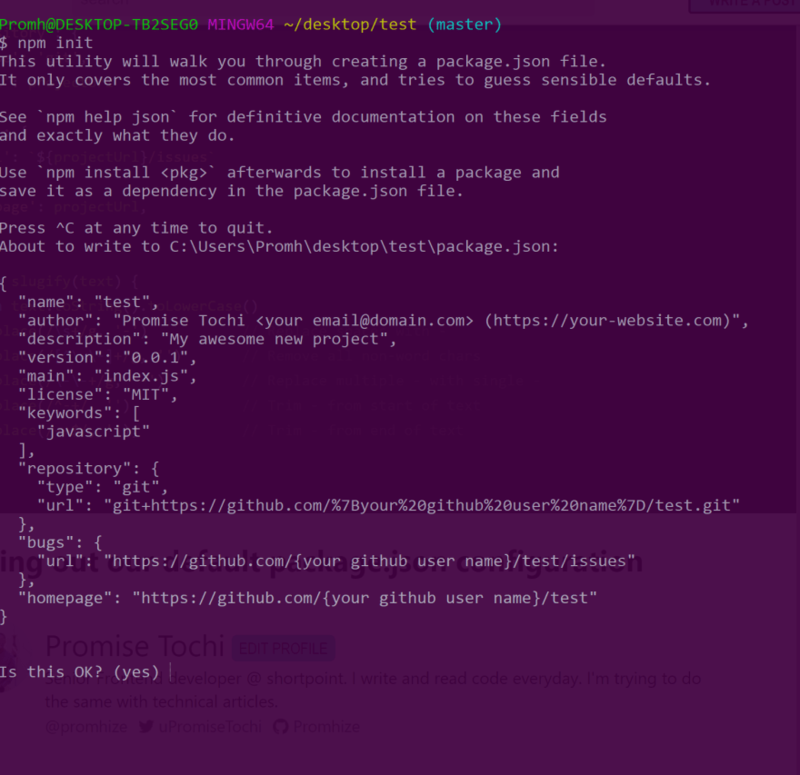 Open a terminal(preferably git-bash on windows)anywhere on your PC , and run cd ~ this will point the terminal to your home directory. Next, run echo "const path = require('path')" >.npm-init.js. This will create a .npm-init.js file in the home directory. The email and website details are optional in the author property. You might be thinking why we have to go through all these trouble and end up with a static default name; "why are you wasting my time man?!" Next we'll add in default repository, bugs and homepage properties. To use the default configuration, type yes in the terminal and hit the Enter key. Hopefully, that should save you a few minutes when creating a new npm package in the future, if not I hope you learnt something new. Thanks for reading all the way, happy coding. This is my first article in 2019 and I hope to write a lot more. Nice but take it one step further, package.json supports variables.